"HOW TO CREATE A WIKISITE?" Nirmal Saeed & Ammara Nasim. Before we can actually start telling the procedure of how one can create their own Wikisite we need to tell what exactly are the wiki sites, how they came into being and what exactly are their applications? This table of contents can help you to get to a specific topic. What is a Wiki site??? How to Make a Wiki Site on Wikidot??? How to Choose a Wikisite??? A wiki is a single web page or a collection of web pages that are specifically designed in such a way that anyone who accesses them can contribute new content or modify the existing content by using a simplified markup language. In other words we can say that Wiki site is basically a type of website which can be created and edited by the common web users. The world’s first ever site which was named a wiki was “WikiWikiWeb”. It was developed by Ward Cunningham in the year 1994, and installed on the Internet domain c2.com on the 25th of March, 1995. It was named as “Wiki-Wiki” by its creator as an alternative for the word 'quick' since “wiki” literally means quick in Hawaiian. Cunningham’s inspiration for this system was the Apple's “HyperCard”; a system that allowed its user to create virtual "card stacks" supporting links among the various cards. He developed the idea by allowing the users to comment on and change one another's text. The wikis grew extremely popular in the enterprise as collaborative software in the early 2000s. Although initially meant to be used by only the technical users for project communication, intranets, and documentation nowadays their use has grown beyond that. Nowadays wikis have replaced the “static intranets” becoming the only “collaborative software” in many companies. As wiki sites allow their users the freedom of editing or modifying their content, knowledge can now be upgrade by anyone (in a public site) the importance of such sites is given briefly below. • These websites are usually used to create and power community websites. • They are also used in business to provide intranet and knowledge management systems. • They are very effective tools for sharing information, knowledge or research with people around the globe. • Various topics on a wiki site can be associated with each other simply by creating page links on the related pages. • A wiki site allows the user to engage in the process of creation and collaboration that constantly changes the website landscape. Now we will describe the basic steps which need to be remembered while making a wiki site. 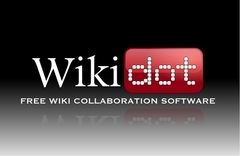 Here we will be taking wikidot as an example to create a wikisite. • Go to “www.wikidot.com” and click on the “create account” button. • Fill in the required information such as your user name, email address, login password and preferred language, to get your user account. When you are done filling in all the required fields simply click on “next”. • Now go to your email account. You will receive an email from wikidot.com containing a “verification code” to confirm your mailing address. Now on the next page this “verification code” and once again click on "next". • Once your account has been created click on “create your very own site” to start making your website. • A new window opens up. Here enter the name for your wikisite along with its web address so that it can be accessed later. Also select your preferred language. After reading and confirming the “terms of usage” click on the “Get my Free Wikidot Site” button at the bottom of the window. • You can easily edit the pages using the “edit” tag at the bottom right of the window or you can use “how to edit pages?” option in the panel on the left of the page. • Once the editing page is opened you can remove, add or edit the information being displayed on the actual page by performing the above mentioned actions on the “editing page and “saving” them. • The site also allows you to save your work while still editing the page. To avail this facility simply click on “save and continue”option. • Sometimes while modifying the contents of a page you might want to actually view the changes that might occur on the page before actually saving them. For this purpose click on the “preview”button which is right before the “save and continue” button. • If for some reason you might want to view the changes occurring on the page i.e. if you want to see what differences will be there in the modified page before you actually wish to finalize them, use the “view diff” button. • The tool to utilize for managing the numerous pages on you wiki site is the “site manager”. • Using the “appearance” tab you can change the entire outlook of you page by using the preset themes or designing your own themes. • It is entirely up to you whether if you want the site to be open for editing to anyone who accesses the site or if it ought to be open for some specific users only. In order to do those simply click on "public or private"
Although wikidot.com is a really good site for people who want to create wikis but sometime one may wish to utilize certain facilities which might be unavailable on this site. For those who might be looking for certain specifications the following link is just the tool to help you decide yourself, which wiki is the best option fo you.